The seasonal climate drivers of the carbon cycle in tropical forests remain poorly known, although these forests account for more carbon assimilation and storage than any other terrestrial ecosystem. 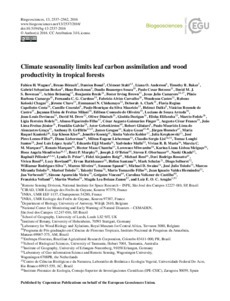 Based on a unique combination of seasonal pan-tropical data sets from 89 experimental sites (68 include aboveground wood productivity measurements and 35 litter productivity measurements), their associated canopy photosynthetic capacity (enhanced vegetation index, EVI) and climate, we ask how carbon assimilation and aboveground allocation are related to climate seasonality in tropical forests and how they interact in the seasonal carbon cycle. We found that canopy photosynthetic capacity seasonality responds positively to precipitation when rainfall is < 2000 mm yr−1 (water-limited forests) and to radiation otherwise (light-limited forests). On the other hand, independent of climate limitations, wood productivity and litterfall are driven by seasonal variation in precipitation and evapotranspiration, respectively. Consequently, light-limited forests present an asynchronism between canopy photosynthetic capacity and wood productivity. First-order control by precipitation likely indicates a decrease in tropical forest productivity in a drier climate in water-limited forest, and in current light-limited forest with future rainfall < 2000 mm yr−1.